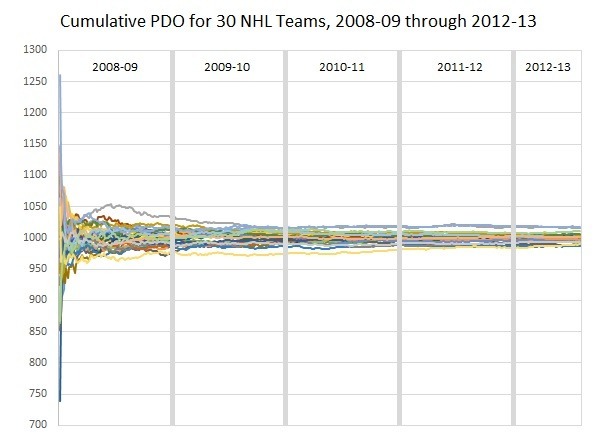 Above is the progressive stabilization (game-by-game, cumulatively) of all-situations PDO over time for the 30 NHL teams. It’s a demonstration of the pull of PDO towards the average (1000, or the addition of team SV% and shooting percentage with decimals removed), and it gives you a sense of the end game: an actual spread of PDO, from roughly 975 to roughly 1025. In other words, if you were just to use this data, you could probably conclude that it’s not outside expectations for a team to outperform 1000 by about 25 (or 2.5%) on either side. That’s all well and good, but PDO is a breakdown of two very different things, a team’s shooting and goaltending, two variables that understandably have very little to do with each other (they are slightly related because rink counting bias usually affects both). Shooting percentage can hinge on a number of contextual variables, though its reliance on a team’s player population usually can bring it a bit in-line with league averages. Save percentage, on the other hand, hinges on one player, and what’s more past performances suggest that a single goaltender can quite significantly outperform expectations. 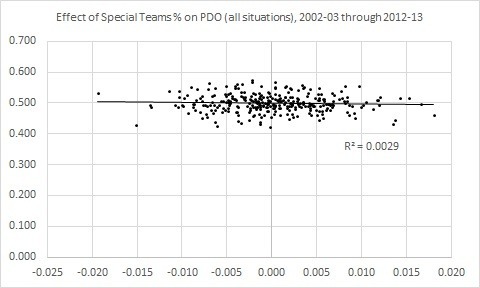 In this piece, I want to jump into the sliding variables of PDO, and what we can expect from teams, but first I want to begin with why I’m working with all-situations PDO. PDO is an interesting, intuitive statistic, so it seems. If it’s above 1000, we should expect it to gradually regress to 1000 (“gradually” the operative word; a high PDO doesn’t change the likelihood of below or above-average PDO in the future). But what I’ve always wondered is what kind of effect powerplay time could have on all-situations PDO. Penalties are undeniably a behavior, and my thinking was that, rather than just relegating PDO to a luck barometer, we might use all-situations PDO to see if there are teams that either exhibit consistently higher/lower-than-average PDO (due to talent) or because they artificially affect it with more/less powerplay than shorthanded time. The y-axis is the team’s ST%, and x-axis is the change in the metric identified. Most teams appear to fall in a continuum of adding or losing 2 percentage points in the shot battle due to their penalty behavior. On the other hand, there doesn’t seem to be any discernible effect on PDO. In both cases, there’s nearly no relationship, although SV% might have a slight blip there. 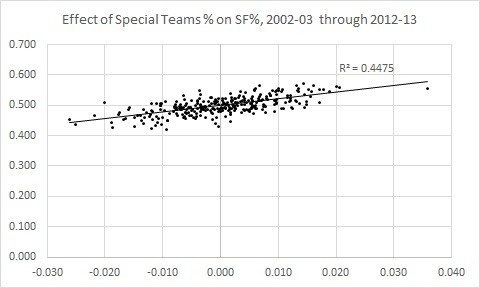 What does this tell us, and why does it make PDO “marvelous?” Because PP time does in fact increase team shooting percentage and PK time does in fact decrease team save percentage (there was no exception to those rules these last 10 years), but the shallow distribution and luck in those percentages nearly eliminates ST% as an effect on all-situations PDO. 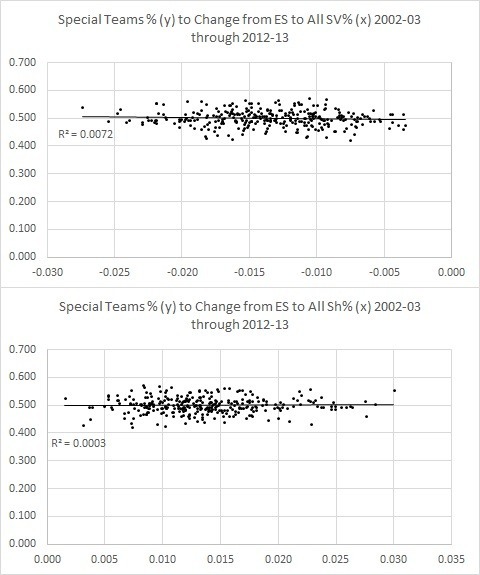 So, if special teams time isn’t expected to affect PDO, could a team still exhibit PDO “talent?” Per the head graph of this article, the short answer is that, yes, it is possible. But under what circumstances, and to what degree? Without even looking, we should say “extraordinary” and “minimal” because PDO does pull hard to its mean. On the other hand, we also know that shooting relies on the team of shooters, while save percentage relies almost entirely on one person. 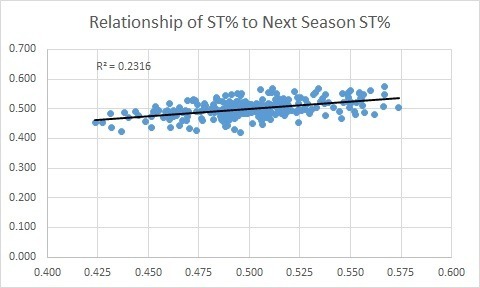 Now, there is the possibility that team shooting percentage could be influenced by how many of the shots are taken by defensemen, but that percentage is about as stable as ST% across teams, and there is some historical evidence that defensemen are shooting less now than they did about 15 years ago while shooting percentage league-wide has decreased. With this knowledge, then, it seems intuitive that the more sustainable PDO defiance more likely would come from good or bad goaltending (the latter is less likely to persist, since most teams besides the Jets recognize and remove bad goaltenders! )…but that doesn’t appear to hold true. Overall, SV% minus league average returns a slightly better r-square than Sh% when compared to the following season(0.12 to 0.09), so the macro-stats don’t support that idea; looking anecdotally tells us something more interesting: the fickle nature of NHL rosters can strike goaltending a bit more than shooting. Take the Boston Bruins, for example – their goaltending has returned high PDOs the last four years, but within that time frame they switched from Tim Thomas to Tuukka Rask, and we couldn’t assume from the outset that Rask would uphold Thomas’s standard and maintain that talent. It’s a similar case with the Vancouver Canucks, though Luongo returning provides a good counterpoint. Conversely, Toronto had a stretch of terrible goaltending (see their yellow line in the first graph? ), but you couldn’t necessarily expect that to hold true across their, like, 50 goaltenders during that time. Thankfully for them they’ve recovered from those doldrums, though now they’re just achingly bad in the possession game. The shooting player population, on the other hand, can maintain a core group that could a.) take the bulk of the team’s shots, and b.) minimize the effect of one player’s good/bad luck. The Ottawa Senators provide a good case in-point. They’ve been recognized by Tyler Dellow in the past as a potential possession dynasty, but they were also a shooting dynasty – maintaining 1% or more above league average shooting for 6 years from 2002-03 through 2007-08 (while experiencing average goaltending). Pittsburgh was also able to maintain a similar streak for 4 years, from 2005-06 through 2008-09. On the other side, Florida’s stretch of under-shooting league average by 1% or more has maintained itself for 3 years now, and it seems likely that they’ll do it again this year. For the record, among all those PDO goaltending and shooting “talents,” none of them consistently held ST% above or below 50%. Also, I am aware of the possibility of recording bias affecting these percentages (another “marvelous” thing about PDO is that it essentially removes recording bias), but I’d counter that as far as we know, recording bias is limited, and none of the teams above are among the usual suspects for recording bias (NJD, NSH, MIN). PDO is a neat, helpful statistic, and you don’t necessarily need to focus on even-strength to find some interesting, storytelling data. Going through the exercise above, hopefully you can see the strength of the pull of PDO’s 1000 average. 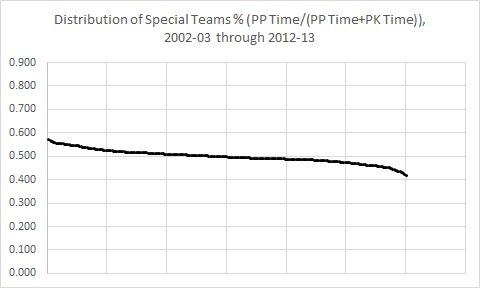 It’s so strong that it really keeps us from labeling any more than maybe 5-7% of the last 300 team performances (just under one team a year) as indicative of anything that might be called PDO “talent.” Even then, looking at the teams I’ve considered PDO “talent,” it’s still not reasonable to expect much more than a 1% boost, rather than the 2.5% demonstrated at the beginning.